Fantastic Films: Will it feature the same Alien? Fantastic Films: The company the crew works for seems to be very sinister. Will they be elaborated on more? Carroll: That’s a possibility. I would think that’s one of the things we might do. We also have, for example, the planet and all that. I think that the sequel would have more. I’m not saying necessary of that planet, but of the fantasy of science fiction in terms of design. The Alien, merely stunned by its close encounter with the shuttle engines, manages to survive outside the craft and reaches civilisation along with Ripley. A second expedition to the planetoid is stranded there and, weathering a storm within the derelict and their own ship, its members deal with a group of Aliens, climaxed by the appearance to whose race the Space Jockey belongs. A prequel, rather than a sequel, telling the tale of the Space Jockey and ending where Alien begins, with the arrival of the Nostromo crew. The planetoid of the Alien explodes, sending Alien eggs to Earth where -shades of Invasion of the Body Snatchers– a whole flock of the monsters run rampant. But despite all of Ridley’s theorising and the commercial and cultural success of the original, the sequel did not appear. The reason for this is perplexing but simple: Twentieth Century Fox did not want it. Alan Ladd Jnr., the head of Fox who had heralded both Star Wars and Alien (and affectionately called ‘Laddy’ by Ridley Scott and co.) left the company in 1979 to found his own production firm, The Ladd Company, whom most will recognise as the producers of another science-fiction classic, Blade Runner. 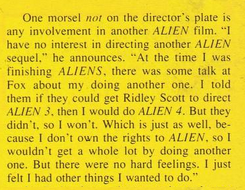 Ladd’s replacement was Norman Levy, who, according to Giler, opposed the very notion of an Alien II. The producers then proceeded to band ideas about. “David and I sat down and had a discussion about what the sequel should be,” Walter Hill told Film International in 2004. “We figured the next one should be a straight action thriller -the military takes over- a patrol movie.” But though ideas had begun to materialise, Giler and Hill, who both confessed to sci-fi not being their area of expertise, made no headway on a screenplay for the film. The breakthrough came when Larry Wilson, a development executive working for the Phoenix Co. (Giler’s production company), came across a script called The Terminator. “It was electrifying,” he recalled. “I put the script on David’s (Giler) desk and said, ‘This is the guy.’” Giler and Hill, after perusing the script, had to agree that Cameron had talents worth investigating, and they arranged a meeting with the budding filmmaker to discuss ideas for a film, though not specifically an Alien sequel. Cameron cut his teeth on films like Roger Corman’s Battle Beyond the Stars (1980) before branching out to write and direct his own features. ~ John Carpenter, Sci-fi-online, 2008. Cameron, a science-fiction fan since his childhood, had already made attempts at sci-fi scripts in the vein of Alien and Star Wars before, none of which he had developed, but could now mine for his Alien sequel just as Dan O’Bannon had amalgamated his own Dark Star with a myriad of other ideas and influences. One of Cameron’s unproduced screenplays, titled ‘Mother’, was extensively reworked and would come to form the many throughlines of Alien II. Another theme of Alien II would be one that James Cameron was fascinated with for some time: “Would you be willing to go into hell for someone, and if so, who would it be, and what would your relationship to them be?” Though the original Alien ended with what David Giler termed a “Sleeping Beauty … lyrical ending,” Cameron geared the sequel to encompass more than lyricism, but a sense of healing and catharsis for both Ripley and the audience. The first public announcement that Cameron had written the sequel came in December 1984, when he told Starlog magazine: “I have written the screenplay for Alien II. It does exist. What will be done with it, no one really knows. I can’t really say anything more about Alien II than that it exists.” While drafting the screenplay Cameron, who had never intended for his sequel to imitate the original film, concocted a title that shed the roman numerals and allowed it to immediately air its own identity. “I don’t know Dan O’Bannon,” he explained, “but I read an interview with him that said he was typing away one night at four o’clock in the morning, and he was writing , ‘the Alien did this, the Alien did that,’ and he realised that the word ‘alien’ stood out on the page. It was very much like that for me on this film. I was writing away and it was ‘Aliens this and Aliens that’ and it was just right. It was succinct. It had all the power of the first title, and it also implied the plurality of the threat. It also implied, of course, that it’s a sequel, without having to say Alien II.” The first draft was handed into Fox in early 1984, and was received with enthusiasm by the studio. There was some sweat shed over the cost: Cameron’s partner and producer Gale Anne Hurd insisted the film could be made for around $15.5 million; Fox estimated it would total an unacceptable $35 million. ~ Sigourney Weaver, Starbust, 1987. 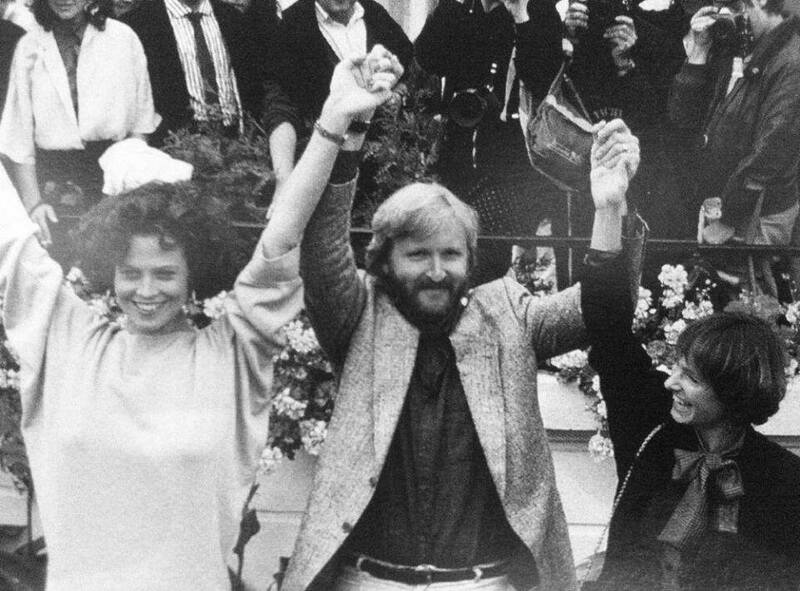 Sigourney Weaver, James Cameron, and Gale Anne Hurd at the Aliens premiere, 1986. “I’m wondering if Alien 3 is in the typewriter?” Bobby Wygant asked James Cameron upon the release of Aliens in 1986. “Not for me it’s not,” he answered. ~ James Cameron, Starlog magazine, September 1986.